The political fallout associated with the attacks Tuesday on a U.S. diplomatic mission in Benghazi that left four dead, including an American ambassador, was the product of a fluid and quickly evolving situation on the ground in Egypt and Libya. President Barack Obama delivers a statement alongside Secretary of State Hillary Clinton, following the death of the U.S. Ambassador to Libya, Chris Stevens, and others, in the Rose Garden of the White House in Washington, September 12, 2012. At the heart of Mitt Romney's criticism of President Barack Obama (for "apologizing for the right of free speech") was a statement issued by the U.S. Embassy in Egypt on Tuesday as protests there and in Libya crept up in reaction to a controversial film about the Islamic prophet Muhammad, a clip of which was set for screening by the Florida pastor Terry Jones. The Embassy of the United States in Cairo condemns the continuing efforts by misguided individuals to hurt the religious feelings of Muslims – as we condemn efforts to offend believers of all religions. Today, the 11th anniversary of the September 11, 2001 terrorist attacks on the United States, Americans are honoring our patriots and those who serve our nation as the fitting response to the enemies of democracy. Respect for religious beliefs is a cornerstone of American democracy. We firmly reject the actions by those who abuse the universal right of free speech to hurt the religious beliefs of others. We did have reports just before I came down here that we had a protest outside our embassy in Cairo. We had some people breach the wall, take the flag down, replace it -- what I heard was that it was replaced with a ... With a black flag -- a plain black flag, but I may not be correct in that. We are obviously working with Egyptian security to try to restore order at the embassy and to work with them to try to get the situation under control. By mid-afternoon Tuesday, this statement provoked criticism from some conservative bloggers, who characterized it as an "apology" for American values (i.e., free speech) rather than a strong condemnation of the protests, which would later metastasize into attacks on those diplomatic missions. Conservatives furthermore suggested that it was no coincidence that these demonstrations were occurring on the 11-year anniversary of the Sept. 11 terror attacks on New York and Washington. Through it all, the situation on the ground in Egypt and Libya was changing rapidly. NBC News and other news organizations were monitoring reports that the situation in both countries was potentially deteriorating. 2) Of course we condemn breaches of our compound, we're the ones actually living through this. As the evening progressed, vague reports emerged suggesting that an "American" had been killed in the Libya assault, though there was no indication of that person's identity. It had been emphasized to news organizations that the situation in Libya was fluid. The U.S. ambassador to Libya and three other Americans were killed after protesters angry over a film that ridiculed Islam's Prophet Muhammad stormed the U.S. consulate in the eastern Libyan city of Benghazi. "The statement by Embassy Cairo was not cleared by Washington and does not reflect the views of the United States government," an administration official told POLITICO. Secretary of State Hillary Clinton comments on the death of U.S. ambassador to Libya, Chris Stevens. I condemn in the strongest terms the attack on our mission in Benghazi today. As we work to secure our personnel and facilities, we have confirmed that one of our State Department officers was killed. We are heartbroken by this terrible loss. Our thoughts and prayers are with his family and those who have suffered in this attack. This evening, I called Libyan President Magariaf to coordinate additional support to protect Americans in Libya. President Magariaf expressed his condemnation and condolences and pledged his government's full cooperation. In light of the events of today, the United States government is working with partner countries around the world to protect our personnel, our missions, and American citizens worldwide. At 10:26 p.m. ET, the Romney campaign lifted its embargo on the GOP candidate's statement. Obama sympathizes with attackers in Egypt. Sad and pathetic. At 6:17 a.m. ET, NBC News confirmed and reported that U.S. 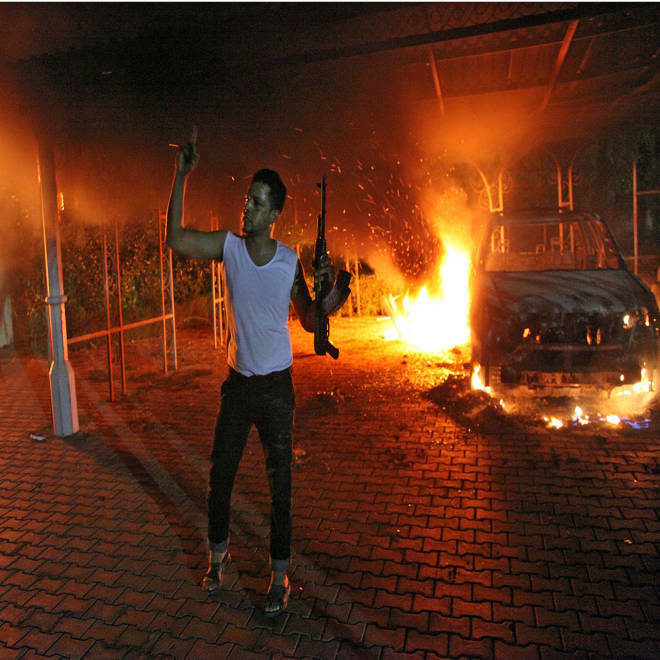 Ambassador to Libya Christopher Stevens was among those killed at the mission in Benghazi. 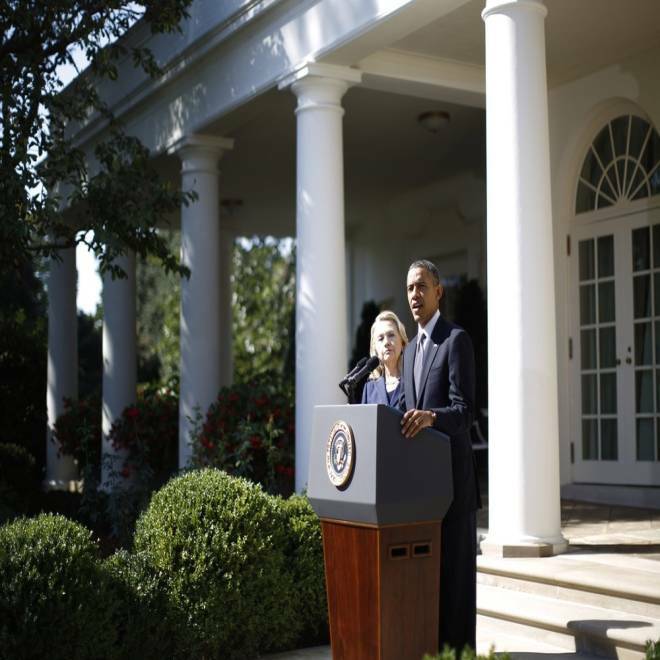 President Obama, alongside Secretary of State Hillary Clinton, condemns "in the strongest terms" the "outrageous and shocking attack" that claimed the lives of Ambassador Chris Stevens and three other Americans at the U.S. consulate in Benghazi, Libya. I strongly condemn the outrageous attack on our diplomatic facility in Benghazi, which took the lives of four Americans, including Ambassador Chris Stevens. Right now, the American people have the families of those we lost in our thoughts and prayers. They exemplified America's commitment to freedom, justice, and partnership with nations and people around the globe, and stand in stark contrast to those who callously took their lives. I have directed my Administration to provide all necessary resources to support the security of our personnel in Libya, and to increase security at our diplomatic posts around the globe. While the United States rejects efforts to denigrate the religious beliefs of others, we must all unequivocally oppose the kind of senseless violence that took the lives of these public servants. On a personal note, Chris was a courageous and exemplary representative of the United States. Throughout the Libyan revolution, he selflessly served our country and the Libyan people at our mission in Benghazi. As Ambassador in Tripoli, he has supported Libya's transition to democracy. His legacy will endure wherever human beings reach for liberty and justice. I am profoundly grateful for his service to my Administration, and deeply saddened by this loss. The brave Americans we lost represent the extraordinary service and sacrifices that our civilians make every day around the globe. As we stand united with their families, let us now redouble our own efforts to carry their work forward. It is with profound sadness that I share the news of the death of four American personnel in Benghazi, Libya yesterday. Among them were United States Ambassador to Libya Chris Stevens and Foreign Service Information Management Officer, Sean Smith. We are still making next of kin notifications for the other two individuals. Our hearts go out to all their families and colleagues. A 21 year veteran of the Foreign Service, Ambassador Stevens died last night from injuries he sustained in the attack on our office in Benghazi. I had the privilege of swearing in Chris for his post in Libya only a few months ago. He spoke eloquently about his passion for service, for diplomacy and for the Libyan people. This assignment was only the latest in his more than two decades of dedication to advancing closer ties with the people of the Middle East and North Africa which began as a Peace Corps Volunteer in Morocco. As the conflict in Libya unfolded, Chris was one of the first Americans on the ground in Benghazi. He risked his own life to lend the Libyan people a helping hand to build the foundation for a new, free nation. He spent every day since helping to finish the work that he started. Chris was committed to advancing America's values and interests, even when that meant putting himself in danger. Sean Smith was a husband and a father of two, who joined the Department ten years ago. Like Chris, Sean was one of our best. Prior to arriving in Benghazi, he served in Baghdad, Pretoria, Montreal, and most recently The Hague. All the Americans we lost in yesterday's attacks made the ultimate sacrifice. We condemn this vicious and violent attack that took their lives, which they had committed to helping the Libyan people reach for a better future. America's diplomats and development experts stand on the front lines every day for our country. We are honored by the service of each and every one of them. The president was informed of the Libya situation by NSA Donilon yesterday afternoon as he started his weekly meeting with the Secretary of Defense and the Chairman of the Joint Chiefs. The President was updated on both incidents several times throughout the evening and again this morning. The president was notified last night that Ambassador Stevens was unaccounted for and then notified again this morning about his tragic death. This is an attack that should shock the conscience of people of all faiths around the world. We condemn in the strongest terms, this senseless act of violence and we send our prayers to the families, friends and colleagues of those we've lost. All over the world every day, America's diplomats and development experts risk their lives in the service of our country and our values because they believe that the United States must be a force for peace and progress in the world, that these aspirations are worth striving and sacrificing for. Alongside our men and women in uniform, they represent the best traditions of a bold and generous nation. In the lobby of this building, the State Department, the names of those who have fallen in the line of duty are inscribed in marble. Our hearts break over each one. And now because of this tragedy, we have new heroes to honor and more friends to mourn. GOP presidential hopeful Mitt Romney criticizes the Obama administration concerning their response to the "disgusting" attack on the US consulate in Libya in which Ambassador Chris Stevens and three other Americans were killed. Around the same time, Romney re-arranged a planned rally in Jacksonville, Fla., to hold a 10:16 a.m. ET press conference, used in part to reiterate his criticism of Obama. America will not tolerate attacks against our citizens and against our embassies. We'll defend also our constitutional rights of speech and assembly and religion. We have confidence in our cause in America. We respect our Constitution. We stand for the principles our Constitution protects. We encourage other nations to understand and respect the principles of our Constitution, because we recognize that these principles are the ultimate source of freedom for individuals around the world. I also believe the administration was wrong to stand by a statement sympathizing with those who had breached our embassy in Egypt, instead of condemning their actions. It's never too early for the United States government to condemn attacks on Americans and to defend our values. The White House distanced itself last night from the statement, saying it wasn't cleared by Washington. That reflects the mixed signals they're sending to the world. I think it's a terrible course for America to stand in apology for our values. That instead, when our grounds are being attacked and being breached, that the first response of the United States must be outrage at the breach of the sovereignty of our nation. An apology for America's values is never the right course. The White House also issued a statement saying it tried to distance itself from those comments and said they were not reflective of their views. I had the exact same reaction. These views were inappropriate. They were the wrong course to take when our embassy has been breached by protesters. The first response should not be to say, "Yes, we stand by our comments that -- that suggest that there's something wrong with the right of free speech." The president takes responsibility not just for the words that come from his mouth, but also from the words that come from his ambassadors from his administration, from his embassies, from his State Department. They clearly sent mixed messages to the world and the statement that came from the administration and the embassy is the administration. The statement that came from the administration was a statement which is akin to apology and I think was a severe miscalculation. Every day all across the world, American diplomats and civilians work tirelessly to advance the interests and values of our nation. Often, they are away from their families. Sometimes, they brave great danger. Yesterday, four of these extraordinary Americans were killed in an attack on our diplomatic post in Benghazi. Among those killed was our ambassador, Chris Stevens, as well as Foreign Service Officer Sean Smith. We are still notifying the families of the others who were killed. And today, the American people stand united in holding the families of the four Americans in our thoughts and in our prayers. The United States condemns in the strongest terms this outrageous and shocking attack. We're working with the government of Libya to secure our diplomats. I've also directed my administration to increase our security at diplomatic posts around the world. And make no mistake, we will work with the Libyan government to bring to justice the killers who attacked our people. Since our founding, the United States has been a nation that respects all faiths. We reject all efforts to denigrate the religious beliefs of others. But there is absolutely no justification for this type of senseless violence. None. The world must stand together to unequivocally reject these brutal acts. Throughout the morning, statements from a variety of lawmakers flowed in, though most Republicans avoided the kind of harsh criticism of Obama voiced most prominently by Romney. Republican vice presidential candidate Paul Ryan, says, "This is a time for healing. It's a time for resolve. In the face of such a tragedy, we are reminded that the world needs American leadership." At 12:14 p.m. ET, Republican vice presidential nominee Paul Ryan appeared in Wisconsin to address the Libya situation, though he also avoided direct criticism of Obama. I want to begin unfortunately on a somber note. We woke up to some pretty disturbing news this morning. I know all Americans today are shocked and saddened by the news from the Middle East. The attacks on our diplomatic missions in Egypt and Libya and the loss of four American lives including our Ambassador J. Christopher Stevens. This is outrageous. Our hearts are heavy and our thoughts and prayers are with the victims and their families and I would just like to ask at this moment that we join together in a moment of silence in memory of them. [MOMENT OF SILENCE] Thank you. This is a time for healing. It is a time for resolve. And in the face of such a tragedy, we are reminded that the world needs American leadership. And the best guarantee of peace is American strength. "The cause to which they dedicated their lives and gave their lives, democracy, partnership, tolerance, stands in sharp contrast to the values of those who callously took their lives," he said. "And let me be clear, we are resolved to bring to justice their killers."